The most destructive weapon humanity has ever developed could help our species avoid going the way of the dinosaurs. Pretty much any asteroid that poses a threat to Earth can be blasted out of the heavens using a nuclear bomb, even with warning times of a week or less, say a team of scientists who have been developing the idea. The Feb. 15, 2013 meteor blast over Chelaybinsk damaged hundreds of buildings and injured more than a thousand people. [See the full Russian meteor infographic here. Wie presented his team's latest findings nearly a year to the day after a previously undetected 65-foot-wide (20 meters) space rock detonated in the skies above the Russian city of Chelyabinsk, injuring 1,500 people. He and many other researchers regard the Feb. 15, 2013 Russian meteor explosion— which took locals and scientists alike by surprise — as a wake-up call about the threat Earth faces from incoming space rocks. "A couple of years ago, I had to use the dinosaur example to justify our research," he said, referring to the asteroid impact that wiped out the giant reptiles 65 million years ago. "Now, that's no more — we had this major event." It's just a matter of time before Earth gets hit again, Wie and other scientists stress — and the next strike may inflict far more damage. In a perfect world, hazardous space rocks would be detected decades before their close encounters with Earth, giving humanity enough time to launch robotic "gravity tractors," which would nudge the asteroids off course by flying alongside them for long periods of time. But our species needs a strategy to employ when a dangerous asteroid pops onto the radar with much less time to spare — less than a year, for example. And nuclear bombs are the best answer, Wie said. A Hypervelocity Asteroid Intercept Vehicle (HAIV) mission architecture, which blends a hypervelocity kinetic impactor with a subsurface nuclear explosion for optimal fragmentation and dispersion of hazardous near-Earth objects (NEOs), has been developed with the help of two rounds of NIAC funding. Wie and his colleagues are developing a concept spacecraft called the Hypervelocity Asteroid Intercept Vehicle, or HAIV. They've gotten two rounds of NIAC funding for their work, one in 2011 and the other in 2012. The HAIV would rendezvous with an asteroid in deep space, then send a kinetic impactor barreling into the object to blast out a crater. The nuclear bomb would follow one millisecond behind — perhaps attached via a long boom, or perhaps flying freely — and then detonate inside the hole, shattering the asteroid into millions of tiny pieces. Excavating a crater for the bomb increases its destructive power by a factor of 20, Wie said. Some of the resulting asteroid fragments may still impact Earth, depending on how far away from our planet the explosion occurred. But the effects are likely to be minimal, Wie said. 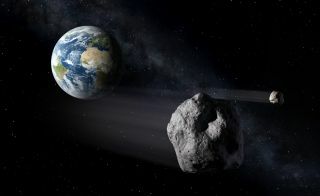 For example, a 1,000-foot-wide (300 m) asteroid can be neutralized far outside Earth's gravitational field with a warning time of just 30 days, according to Wie. Computer simulations suggest that less than 0.1 percent of the destroyed object's mass would eventually strike our planet. "We would have a heavy meteor shower, or maybe 100 Chelyabinsk meteor events," Wie said. But doing nothing, he added, invites a single impact with 150,000 times the power of the bomb dropped on the Japanese city of Hiroshima during World War II. Wie and his team suggest that the HAIV concept be coupled with an asteroid-warning system, such as the Asteroid Terrestrial-impact Last Alert System (ATLAS), a survey effort being led by the University of Hawaii with $5 million in NASA funding. When it's fully operational in 2015, ATLAS should be able to provide a one-day warning for asteroids 26 feet (8 m) wide, a one-week alert for space rocks measuring 148 feet (45 m) across and a three-week warning for 459-foot (140 m) asteroids. That should provide plenty of time to launch an HAIV mission, which would likely cost about $500 million, Wie said. "If our system is going to be built, tested, pre-deployed, ready to be launched at any time, then we solve the problem," he said.